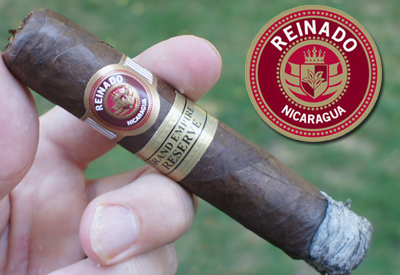 Reinado is a brand which seems to be popping up in quite a few conversations I've had recently. I would guess this has a lot to do with the strong social media presence owner Antonio Lam has taken. Follow him on twitter @ReinadoCigars. 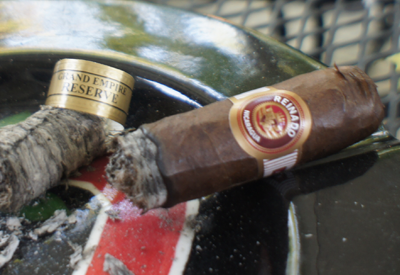 Today's review is for Reinado's new release, the Grand Empire Reserve. 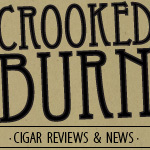 Some quotes from the official Press Release: The Grand Empire Reserve is a box pressed Robusto that incorporates a select habano maduro wrapper and an additional aged Nicaraguan filler which leverages REINADO's signature fermentation process to provide even greater depth, richer undertones, and enhanced overall complexity for both the casual and the distinguished cigar smoker. I was lucky enough to get a sample of this stick at the IPCPR trade show, so let's see how it turned out. 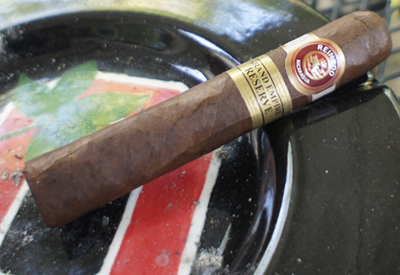 The box press on my Reinado Grand Empire Reserve (GER from now on) was not a very hard press, which I liked because I'm not a fan of very squared off cigars. The wrapper was a medium brown with a lot of reddish hues and minimal veins. Putting the cigar to my nose, I picked up a lot of earthy scents, as well as some tingly pepper. The cap clipped with no issues and the cold draw had a lot of honey and black currant notes. Black currants are something I eat a lot during the holiday season, so I know the taste well, however, it's not a taste I pick up in cigars too often. Right from the first few puffs, my Reinado GER produced some interesting flavors. The profile's front consisted of some hazelnut mixed in with a muted floral taste -- very light and unique. It is not a blend that I am accustomed to, but the tastes seemed to play well together. The finish was a whole different ball game and was right in my wheel house. Each exhale was filled with a spicy cinnamon flavor that seemed to build the more you waited between draws. If you've read any of my past reviews, you know I much I love this taste in cigars. The construction was great (very strong ash) and the nicotine level was in the medium range. 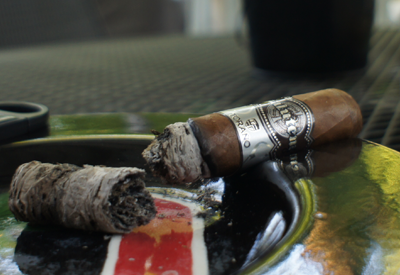 The second third of my Reinado GER had the floral flavor on the front end really explode. It doesn't sound good when I put it this way, but it was almost a potpourri kind of taste, but with a lot of sweetness; very light on the palate and very tasty. The finish backed off a bit on the spice or heat of the cinnamon, but the flavor was still there -- a lot like hard candy. I still didn't have any problems with the construction and the nicotine level maintained a consistent medium. 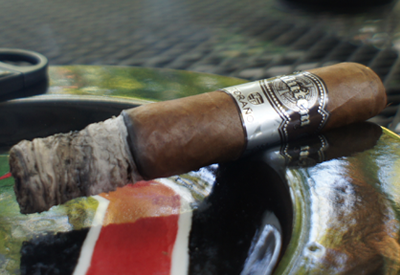 The final third of my Reinado GER was almost a clone of the second third -- a lot of floral sweetness on the front, mixing with candy-like cinnamon on the finish. The one thing that did change was the nicotine strength ramped up into a lower-full strength range. This might have been due to the buildup in my system, but it was noticeable. I took the cigar all the way to the nub and didn't have any touch ups or construction issues. 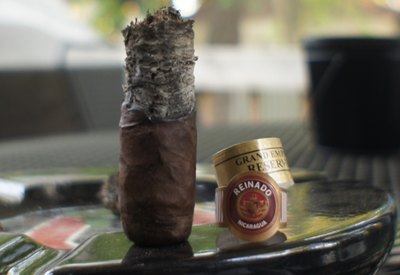 Final thoughts on the Reinado Grand Empire Reserve? This cigar really has two distinct flavor profiles; one that I am all over all the time and one that was pretty new to me. Surprisingly, even with how different they were, both seemed to compliment one other and keep the experience interesting and enjoyable. This was my only sample of this cigar and I was intrigued by it, so I will definitely be getting more. 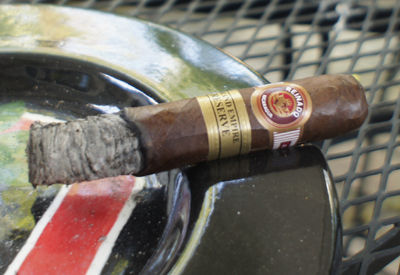 A good showing from team Reinado. Would I buy a box? I'd like to try a few more singles before going for a full box, but it's not out of the question. 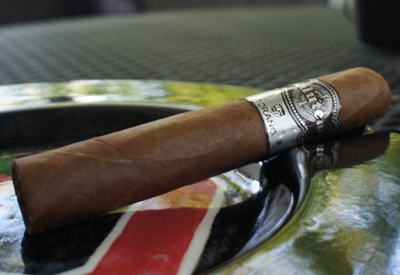 Today's review is for one of the new offerings from Torano Family Cigars, which was recently launched at IPCPR 2012. From what I've been told by a dear friend who works for the company, Salutem has been in the works for a long time. Some quotes from the official Press Release: Salutem is packaged in a unique 12 count box. The cigar is dressed in a beautiful Habano Ecuador wrapper, complemented by a binder from Jalapa, Nicaragua and completed with filler tobacco from the Dominican Republic, Nicaragua, and Cameroon. 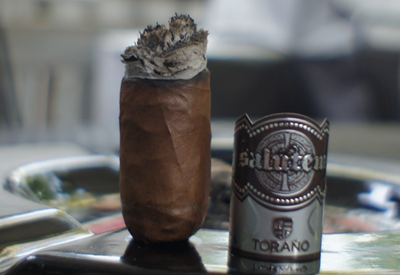 While Toraño blends have featured tobacco from Cameroon in the past, this is the first time Cameroon has been a component of the filler, giving Salutem a distinctive, rich cocoa flavor. Salutem is inspired by the character and strong will of those who overcome great challenges and adversity. Salutem represents a celebration of life and raises a toast to all those who live life to the fullest. My Salutem had a nice elegant looking light/medium brown wrapper. There were a few veins but they didn't take away from the overall smooth texture of the leaf. I'm not totally sold on the design of the band, but I do like the chosen color scheme. The pre-lit aroma consisted of a raisin aroma mixing in with some black pepper. The cigar actually made me sneeze, so I knew there was some power in there. The cap clipped without issue and the cold draw tasted of red wine and black cherries -- an interesting taste for sure. The foot of my Salutem lit easily and started off with a bang of flavors. The front of the profile had a lot of the black cherry notes I picked up on the cold draw, and the finish had a spicy white pepper flavor. The black cherry was very strong and this is the first non-Illusione brand stick I have had that from. Good company to be in, for my personal tastes. The smoke was a little airy and not very dense, but that didn't take away from the strong flavor. I did have to correct the burn once, but after that, the cigar burned straight. The nicotine level was a solid medium. The second third of my Salutem had some additions to the flavor profile both on the front and the finish. The front still had the solid black cherry flavor, but now a salty taste had also started up. That might sound off-putting, but it was unique and actually very tasty. The finish was a bit more of a challenge for me to distinguish. The white pepper was still there, but there was something else that I couldn't put my finger on. The best I could describe it as was a generic nut flavor. Maybe closest to walnuts? I wasn't really sure. The nicotine level moved up a bit during my second third and fell in the lower end of full. The final third of my Salutem saw the black cherry flavor dissipate into more of a burnt sugar sweetness on the front end. The spicy finish also backed off and now tasted of black coffee. Burnt sugar and coffee, a nice finish to almost anything. I smoked this stick down to the nub and it never got hot nor had any other construction issues. The nicotine level stayed in the lower full range. 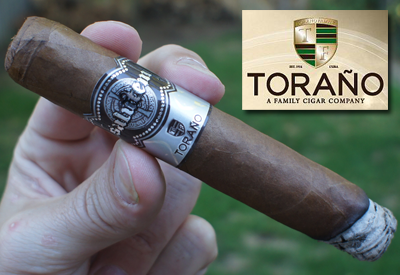 Final thoughts on the Torano Salutem? In the last few years Torano has been really stepping up their game. The Salutem is another large step forward and, for me, I'll make the bold statment that it is the best thing they are currently putting on the market (taking over the Vault, which I said the same thing about last year.) The flavors were strong and well balanced from front to finish. Keep the momentum going Charlie and crew. Would I buy a box? It's only a 12 count box, so for sure box worthy.